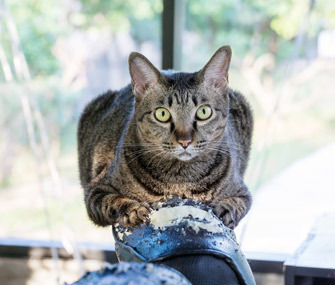 You absolutely can teach your cat to not use your furniture as a scratching post — but before we delve into the specifics of how to change your cat’s behavior, let’s start by talking about why he may be doing this in the first place. Since cats often scratch to shed their outer nail sheaths, regular nail trims might help reduce the scratching. But there could be something more serious going on: Retreating beneath the sofa could indicate that your cat isn’t feeling well, either physically or emotionally. A cat who is fearful, anxious or stressed may take shelter under a couch or bed to escape an upsetting situation — for example, a new baby or new pet in the home. And cats will often mask pain or illness, so your cat may be hiding, because he’s sick or injured. In either case, the first step in dealing with the behavior is to schedule a visit to the veterinarian to determine if your cat is suffering from an undiagnosed medical condition, is in some type of physical discomfort, or if he’s anxious or stressed about something in his environment. Your vet may also refer you to a veterinary behaviorist for extra help as needed. Once your cat has a clean bill of health, you can start to address the behavior. The goal is to redirect your cat’s scratching away from the furniture to something more cat friendly, like a designated scratching post. Cats will frequently scratch furniture, because they lack acceptable replacement activities and spaces that suit their tastes. Teaching your feline to stay clear of the furniture will require providing cat-specific spaces that are more desirable than the area under your couch. Create resting and play spaces that cater to your cat’s preferences, including spaces where he can sleep, hide and survey his surroundings. Burrow beds, tunnels, cat trees — especially those with covered areas and den spaces — allow your cat to watch the action in your home — or escape from it, if needed. Tunnels and boxes also provide spaces to play or just chill. Your cat’s crate or carrier can also serve as a quiet resting place when he wants to be alone. Offer your cat scratching posts in a variety of materials. Some cats prefer carpet-covered posts to sisal, for instance, while others like corrugated cardboard best. If your cat really enjoys lying on his back while clawing and pawing, consider a covered bed or box made of a sturdy claw-worthy material like corrugated cardboard. A scratching post should be sturdy and able to support your cat’s weight as he digs, scratches and paws at the surface. Many cats like to get a full stretch and prefer posts that allow them to extend their limbs fully while clawing. Consider scratching posts that offer both horizontal and vertical options for scratching and stretching. Your cat may enjoy a horizontal scratching post, especially if he’s already scratching horizontal spaces. To help deter your cat from scratching your furniture, place his scratching post near your couch. This makes it easier to distract him from off-limits spaces and redirect him to more appropriate surfaces. At the same time, teach your cat to associate your couch with activities other than scratching. Feed him his meals near the couch and spray pheromone spray in the space to encourage him to rub the area with his facial scent glands. This can help decrease his desire to use visual markings to make others aware of his presence. You can also invite him to snuggle with you on the sofa and reward him for sitting peacefully. Encourage your cat to explore the cat trees and scratching posts with draws of toys, catnip and treats. Channel his excess energy and scratching toward other acceptable activities as well, including food puzzles and toys, particularly toys compatible with solo play when he is alone. Reward your cat for using his cat-specific spaces with petting, play, treats and praise. You may need to use a temporary barrier to prevent your cat from utilizing the space beneath the couch as his hideaway. Citrus scents, double-sided tape and overturned floor mats with the prickly side facing upward can serve as potential deterrents as needed. But before you block his access to the sofa, be sure he has adequate replacement spaces where he can safely get away and hang out.